October is a tricky month for garden produce in Australia. In the community gardens in Katoomba, spring ingredients like peas, reseeding greens like Mizuna and Mibuna may already be bursting to go. Or they might equally have been blown over by a gale, subsumed by frost, dug up by local animals or ripped out by accident! When you don’t know exactly what is going to be in the garden you can always rely on the pantry. Spring is a pretty good time of year for eggs. My hens at home are laying regularly in spring and so there’s always an oversupply of eggs, which is why I’ve chosen this Spring Green Tart to share with you. 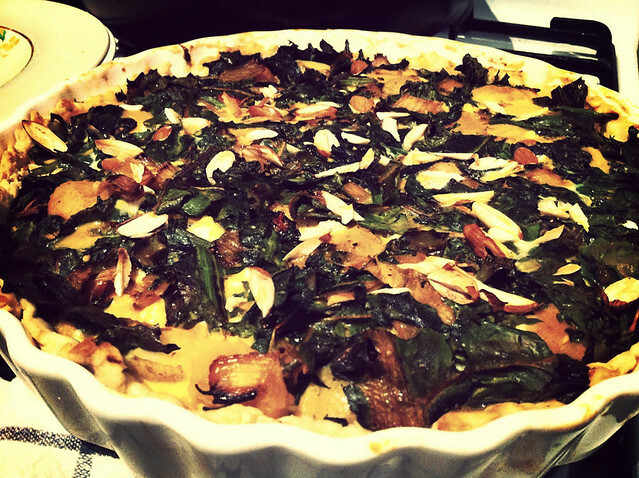 It’s a great base and very easily adapted to become a winter warmer with roast veggies, or a light fragrant tart showing off your garden greens’ seasonal personality. Spring also comes with peas and mint and all the new shoots. Broadbeans planted in autumn well before frost can be grazed for this dish too — you can pull the top tips off, which keeps the plant bushy as well as providing you with stopgap greens in early spring. Gather about 500g of spring greens from the garden or green grocer: If using thicker leafy greens like silverbeet, chop leaves into 2 cm and any stems into ½ cm pieces. Limit herbs to 100g and shred roughly. Thicker leaves like warigal greens need to be sliced more finely since they don’t really wilt like other spinach. Nettles need handling with gloves and given a good dunk in hot water with a little lemon in it to remove the sting and keep that vibrant colour, once they go limp they are safe to handle. Heat oil in large skillet and saute onion until translucent. Add leafy greens and season to taste with salt and pepper. Reduce heat to low, cover and cook for 2 minutes. Remove from heat, stir through peas if using and allow to cool. Mix flour and 1/4 tsp salt with oil and water and stir to form an even dough. Place dough on floured pastry board/table top and roll to fit a 20cm tart pan or quiche dish. Fit dough into pan, trimming any excess. Because it’s an oil based pastry there’s no chance of it sticking, ever. Beat eggs and cheese lightly to combine. Stir in the cooled greens and add salt and pepper to taste. 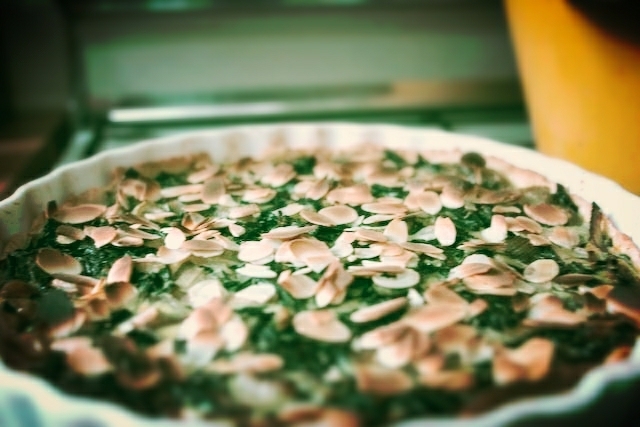 Spoon mixture into tart shell and sprinkle with flaked almonds. Bake for 40 mins, until just firm in the centre. Cool and cut into generous wedges. Serve warm or at room temperature.